Painting by Bob Coleman of the C.S.S. Arkansas. Original can be seen at the Sam Olden Historical Society Museum in Yazoo City, Mississippi. 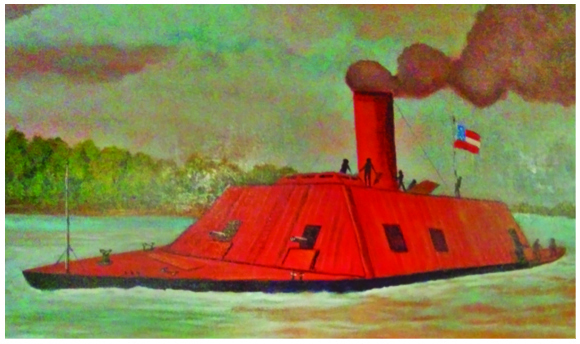 Launched on July 14, 1862 from the Navy Yard in Yazoo City, the ironclad ram “Arkansas” commanded by Lt. Isaac N. Brown successfully engaged the combined Union fleets on the Yazoo and Mississippi rivers. She met the Union vessels “Queen of the West,” “Tyler,” and “Carondelet” on July 15, 1862. The “Arkansas” ran past thirty-nine Union vessels on her way to Vicksburg, helping to end the first exclusively naval siege of Vicksburg. The ironclad was scuttled north of Baton Rouge on August 5, 1862, to prevent capture by Union forces.